Telecommunication tower sites have a number of safety procedures and processes set in place to ensure a tower's integrity is sustained over its lifespan. Guy anchor rods support a guyed tower's structure and, if not properly maintained, galvanic corrosion can build up and lead to tower failure. CellSite Solutions provides anchor rod protection to prevent tower failure. Guy anchor rod inspections are a cost-effective way to ensure your guyed tower maintains its structural integrity over time. We have evolved as experts in this telecom industry service and are a dependable resource for all your tower inspection needs. Contact us today for a free quote! CellSite Solutions deploys crews to existing guyed tower sites to complete the inspection process. First, crews carefully excavate and clean the guy anchor shafts to inspect for damage and corrosion. Then, they take measurements of the shaft's overall dimensions to report any cross-sectional loss. Finally, if little to no loss is observed, our crews coat the anchor shaft with Epoxy Mastic to prevent future corrosion and to remediate any minor corrosion that may have already occurred. Major loss (over 50%) of an anchor shaft is documented by crews, and site technicians are notified immediately of any necessary repairs. In some situations, temporary safety procedures and methods may need to be put in place to provide structural back-up until crews can make repairs. Why Does Your Tower Need A Guy Anchor Rod Inspection? Guy wires and anchor rods are used to support a guyed tower. In order to maintain a proper level of performance, these anchor rods need to be examined periodically to ensure the integrity of the anchor rod has not been compromised. Guy anchor rod inspections remediate and prevent damaging corrosion. And in turn, these inspections ensure the safety, security, and life expectancy of a guy wire tower's structure. 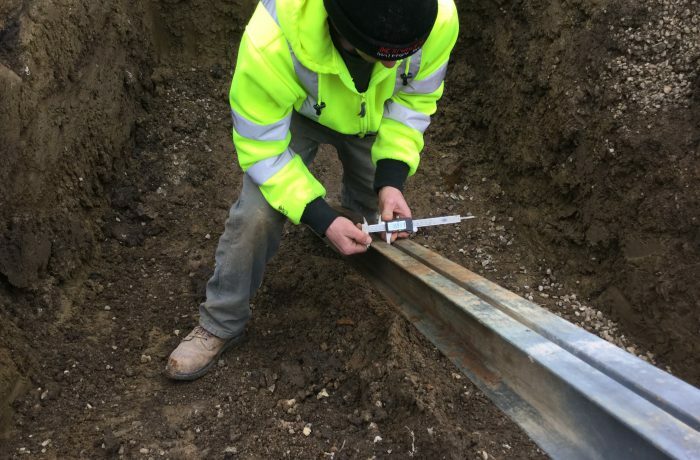 CellSite Solutions has completed over 600 guy anchor rod inspections to date and understands the importance of this service. We strive to provide the most accurate reporting and remediation for our tower customers. Call or contact us today for more information or to get a quote!